Unlike other superfood lists you may have seen that include things like soy, legumes, quinoa, and goji, the Paleo community has a very different idea of what constitutes nutritional power foods. Based on the foods that our hunter-gatherer ancestors ate, the Paleo diet has been linked to numerous health benefits including reduced incidence of diabetes, autoimmune illnesses, cancer, and neurodegenerative diseases. Although prevailing wisdom touts plant foods as the ultimate in nutrition—and animal foods as being detrimental to health—many foods at the top of conventional superfoods lists such as soy, high-glycemic fruits, and legumes contain anti-nutrients and allergens and aren’t used efficiently by the body. 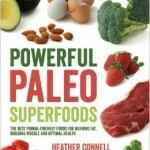 Paleo expert Heather Connell and writer Julia Maranan guide you through the top 50 Paleo superfoods, from power proteins such as wild salmon and locally pastured beef to super fats such as coconut oil and Paleo-approved fruits and vegetables. Each entry includes a delicious recipe so you can start reaping the benefits of these foods immediately. 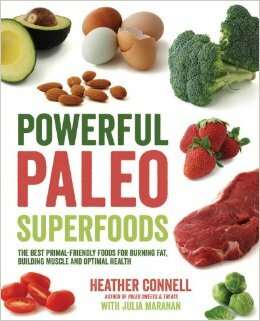 Powerful Paleo Superfoods is your essential guide to getting the best out of your ancestral lifestyle.